Showing results for tags 'Starlight Glimmer'. Reformed Characters Team Is A Go! Another week which means another episode full of the adorable ponies we all know and love! As well as full of the bug ponies that, well, all of us know, and some of us love. We also see the return of our reformed unicorn couplebesties, Glim Glam and Best Unicorn! What new adventure does our redeemed magical equine duet have this time, and what does it have to do with Thorax? Tune in to find out! The episode aired Saturday 11:30 AM EST on September 2nd!! This thread is dedicated to discussing the episode before, during, and afterwards. As the thread is now open it may indeed contain spoilers. As the episode has already been widely aired, there is no need to bother with spoiler tags, just chat away! Sheeee's back!!! Another week and another episode with the ponies we all adore and love! Here we are, the season six finale! This time Queen Chysalis returns with her Changeling army in a new attempt to conquer Equestria! What devious methods will the dark queen use this time in her endless quest to consume all the love in Equestria? Tune in to find out! The episode airs Saturday 11:00 AM EST on October 22nd!! This thread is dedicated to discussing the episode before, during, and afterwards. As the thread is now open it may indeed contain spoilers. I ask that potential spoilers talked about or shown before the episode airs stay within the spoiler tags please, after the episode you no longer have to use the spoiler tags, but warning, if you haven't seen the episode yet after it airs, this thread no doubt will have all sorts of spoilers in reviews, images, etc. So tread at your own risk. How half the fandom sees her. Another week and another episode with the ponies we all adore and love! We maybe not all of us because this week's episode focuses on the most controversial character of the main six seven, Starlight Glimmer! 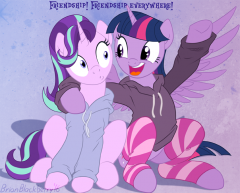 What magical mischief does Starlight get into when learning about friendship? has she truly learned that friendship is earned and not taken via communist coup d'etat? Tune in to find out!! The episode airs Saturday 11:30 AM EST on September 24th!! This thread is dedicated to discussing the episode before, during, and afterwards. As the thread is now open it may indeed contain spoilers. I ask that potential spoilers talked about or shown before the episode airs stay within the spoiler tags please, after the episode you no longer have to use the spoiler tags, but warning, if you haven't seen the episode yet after it airs, this thread no doubt will have all sorts of spoilers in reviews, images, etc. So tread at your own risk. After only a four month hiatus the show we love returns for the sixth season! The mane six return to the Crystal Empire to celebrate a momentous occasion first talked about last season, except they are not going alone, this time they have a seventh, and I don't mean Spike. This the season Twilight becomes the teacher, just as Celestia was to her? Tune in to find out! The episode airs Saturday 11:00 AM EST om March 26th! (They will play the season 5 finale in the hour before). This thread is dedicated to discussing the episode before, during, and afterwards. As the thread is now open it may indeed contain spoilers. I ask that potential spoilers talked about or shown before the episode airs stay within the spoiler tags please, after the episode you no longer have to use the spoiler tags, but warning, if you haven't seen the episode yet after it airs, this thread no doubt will have all sorts of spoilers in reviews, images, etc. So tread at your own risk. Also will see about adding links to videos of the episode when they are available. Just in time for summer! Another week and another episode with the adorable ponies we all love! This week we have our first holiday themed episode of the season, Hearth's Warming Eve! The Equestrian version of Christmas! I am sure you all are feeling the holiday spirit with Christmas only some seven months away! Probably not. Well poor Starlight Glimmer isn't feeling the holiday spirit either, of course maybe because they didn't have holidays in Commieville? Same Town? Whatever her sanctuary was called. Fortunately she has her new mentor around to regale her with tales of holiday cheer, complete with song! How will it go? Will we have another play? Tune in to find out! The episode airs Saturday 11:30 AM EST on May14th! This thread is dedicated to discussing the episode before, during, and afterwards. As the thread is now open it may indeed contain spoilers. I ask that potential spoilers talked about or shown before the episode airs stay within the spoiler tags please, after the episode you no longer have to use the spoiler tags, but warning, if you haven't seen the episode yet after it airs, this thread no doubt will have all sorts of spoilers in reviews, images, etc. So tread at your own risk. Ready for season six? Ready as Twilight, once the student, now becomes the teacher? Yay character evolution! The Light in The Glimmer of A Star: Starlight Glimmer's "Our Cast Thread"
The Even Better, Newest Version of Ready-to-Play Starlight Glimmer: Our Rp Log!